Gustav MAHLER: Symphony No. 6 (1903-5). Budapest Festival Orchestra, Iván Fischer (cond.). Channel Classics CCS SA 22905 (http://www.channelclassics.com/). Distributed in the US by Harmonia Mundi (http://www.harmoniamundi.com/). SACD format. With tour experience the proving ground, Fischer bucks convention, placing the Andante before the Scherzo. In the more common order — Scherzo second — the Sixth becomes bloated: An extra helping of mania follows the initial well-proportioned sonata allegro with the Andante occupying a short gasp before the despairing Finale. Conductors who underscore the Sixth’s tragedy wade into quicksand. Mahler’s hammer-blow effects all too easily misfire — the composer himself found fault with the “wooden box” constructed for the premiere. Adorno and Berg thought this opus prefigured the end of tonality: I find the Ninth’s Rondo-Burleske and the Tenth’s Adagio more effective in this regard. With the Sixth’s Andante in second position, the symphony stands on four legs; each movement’s moods are distinct. 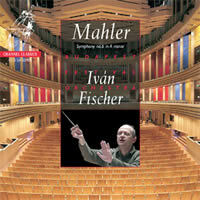 Fischer is an unsentimental Mahlerian. It’s about time. Audiences deserve a less self-indulgent Mahler. The Budapest strings play to the fore assertively. The winds are perfect in the first movement’s gradually disintegrating chorale, the drifting cowbells achieving a marvelously distant spatial effect. Early in the Andante (2:00 here), a chromatic horn solo, which almost always seems out of tune, sounds fine. With its alternating zeniths and nadirs, the Finale remains problematic, yet Fischer does well with the passing scenery’s rich details. 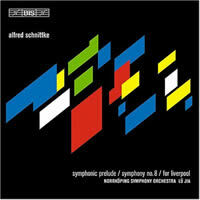 Alfred SCHNITTKE: Symphonic Prelude (1993); Symphony No. 8 (1993-94); For Liverpool (1994). Norrköping Symphony Orchestra, Lü Jia (cond.). BIS CD 1217 (http://www.bis.se/). Distributed in the US by Qualiton (http://www.qualiton.com/). Volume 21 in BIS’ Alfred Schnittke Edition. Schnittke’s last works slump into the great beyond. Having survived several disabling strokes, it’s a wonder he could write at all. His last compositions unfurl as if every note — even the snide ones — were gruelling labors. The five-movement, depressing Eighth defies easy appreciation. Schnittke sublimates polystylistic shenanigans but can still fog the mirror with tragic Mahlerian and Shostakovian vapors. The work strikes the listener as deliberately defective. Remember that Schnittke, who spooled out countless film scores, had a better sense of timing than most of his peers. The forms are strange. The first movement is like a passacaglia without harmony, and the concluding fifth merely ascending scales (possibly with Schnittke looking heavenward). As if moldering, melodies wander into minor-key darkness only to fragment. Striking tunes become tedious through unornamented repetition. A cadential figure develops into the central Adagio’s big theme. The baffling Eighth is best left to Schnittke fans or perhaps even needful Pettersson junkies. Cultivating a complete series, BIS understandably sandwiches the Eighth between contemporaneous pieces. Symphonic Prelude and For Liverpool employ similar motives and share the same bleak mood, hardly suitable for those first dipping their toes. One expects a prelude to be pithy; a well-crafted variation set, the droopy 17:25 Symphonic Prelude progresses from grand to morose. Similarly, For Liverpool impresses the listener as a symphony’s continuation. Jia makes the best of it, expertly directing every harrowing shade of gray. Rozhdestvensky’s orchestra contains the lushest strings. Working continuously in addition to some crucial first-movement solos, the brass is best under Jia. If you’re looking for contrast, Polyansky’s disc finishes with the overtly mordant Suite from “The Census List.” Rozhdestvensky’s release opens with the inscrutable Concerto Grosso No. 6, after which the Eighth seems downright logical. Osvaldas BALAKAUSKAS: Symphony No. 4 (1998); Symphony No. 5 (2001). Lithuanian National Symphony Orchestra, Juozas Domarkas (cond.). Naxos 8.557605 (http://www.naxos.com/). 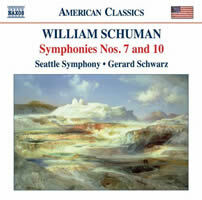 William SCHUMAN: Symphony No. 7 (1960); Symphony No. 10, “American Muse” (1976). Seattle Symphony, Gerard Schwarz (cond.). Naxos 8.559255 (http://www.naxos.com/). Fulfilling Naxos’ second installment towards a complete Schuman symphony edition, the Seventh opens on a warm matte to no purpose. Loud repetitions do not make satisfactory climaxes or arrivals, with their tired dissonance fawning snittily. The second movement tries Varèsian chords manipulated along old-school lines. The development is less than the original exposition. A “Cantabile intensemente” perpetuates a lugubrious mood. Rhythmic variety could have brought the sloshing strings to a boil. The conclusion disingenuously strives for positivism. The more satisfying Tenth launches energetically. The central Larghissimo pulls up at an incompatible major-key conclusion. While Schwarz might have brought more mellowness to the event, I’m guessing that the score provides scant interpretive clues. The rondo-like conclusion harbors a sunny theme. A chime-like variation is particularly inspired. Both symphonies end formulaically with ratcheting percussion crescendos. Too little, too late. With admiration for the Seattle Symphony’s hard work and talents, I was surprised enough by this pairing to replay the series’ first release (Naxos 8.559254, with Nos. 4 and 9, see here). While all appear more comfortable with Schuman’s métier, one could wish for more meat on the bones. Despite Schwarz’s valiant labors, it’s doubtful whether Schuman’s symphonies will ever be viewed as masterpieces. (What’s that I hear? — ah yes, my “American Composer” membership being fed into the shredder.) These clean performances are probably ideal. Far be it from me to say that Schuman’s symphonies don’t deserve good recordings. 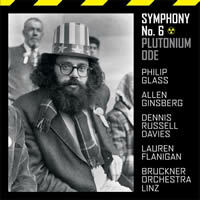 Philip GLASS: Symphony No. 6, “Plutonian Ode” (2002). Lauren Flanigan (sop. ), Allen Ginsberg (recit. ), Bruckner Orchester Linz, Dennis Russell Davies (cond.). Orange Mountain Music OMM0020 (http://www.orangemountainmusic.com/). Distributed in the US by Harmonia Mundi (http://www.harmoniamundi.com/). There are eight Glass symphonies so far. [Can’t somebody please make him stop? Ed.] A recent Second and Third demonstrate Glass’ early endeavors. Despite Marin Alsop’s fine direction of the Bournemouth Symphony Orchestra (Naxos 8.559202), it’s nutty to think that either work will become a repertory staple. The three-movement Sixth may prove more durable. Glass’ varied orchestration works well, from the bass opening to the focused climaxes. For better or worse, Orange Mountain Music releases two versions in the same package. Presumably the disc where Ginsberg recites his 1978 Plutonian Ode over a greatly diminished soprano is intended as a bonus. For my money, it far surpasses its twin, wherein Flanigan’s high warble badly blurs the text. Ginsberg’s drawl is a treat. A symphony with audio supertitles! I’ve always thought Glass’ music functions best as accompaniment to film or soloists. Backing Ginsberg, he sounds mighty fine. The first thing one notices is pronunciation differences. Compared with the singer’s toddler-like articulation, the poet’s scholarly “Uranus” speaks volumes. 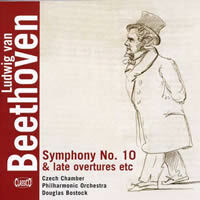 Ludwig van BEETHOVEN: Symphony No. 10 (1824? one mvt. compl. Barry Cooper); Gratulations-Menuett, WoO 3 (1822); Overture “Die Ruinen von Athen,” Op. 113 (1811); Overture “Namensfeier,” Op. 115 (1814); Overture “König Stefan,” Op. 117 (1811); Overture “Fidelio,” Op. 72 (1814); Trauermarsch from “Leonora Prohaska,” WoO 96 (1815); Overture “Die Weihe des Hauses,” Op. 124 (1822). Czech Chamber Philharmonic Orchestra, Douglas Bostock (cond.). Classico Classcd 472 (http://www.classicorecords.dk/). Distributed in the US by Qualiton (http://www.qualiton.com/). Whether or not Beethoven’s Tenth would have ultimately resulted in anything like Cooper’s realized sketches matters little. These are warm and bright performances. However, some spots (the run-up to the Namensfeier coda) exhibit an uncharacteristic casualness in light of Beethoven’s late sonatas and quartets. The placement of the Gratulations-Menuett after Cooper’s first-movement completion is telling: The two do relate, though after the great Ninth we’d expect a less frivolous Tenth despite the perception of Beethoven’s even-numbered symphonies as lighter fare than the odd-numbered works. The overtures are less familiar, and it’s good to have them gathered together. The Czech Chamber Philharmonic Orchestra’s light bass and pleasing winds suggest Schubert, reminding one of a bizarre fact: These two coeval Viennese never met!